Mercedes-Benz team members from the Assembly 2 line in Vance celebrate the all new GLE sport utility vehicle. 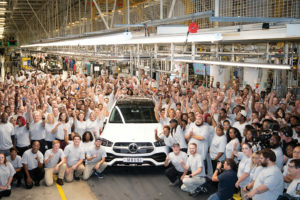 Mercedes-Benz U.S. International (MBUSI), based in Vance, continues to expand its Alabama operation, which manufactures GLS, GLE, GLE Coupe models for distribution worldwide and the C-Class for the North American market. The fourth-generation Mercedes-Benz GLE began production in October and will be in showrooms as early as this spring. Manufacture of electric vehicles, under the EQ brand, is expected to begin in Vance by the beginning of the new decade, says Jason Hoff, president and CEO of MBUSI. Globally Mercedes-Benz has plans to launch at least one electric vehicle in each model series no later than 2022. “We always want to stay on the advanced edge of the automotive industry and be in the position to meet consumer demand for fuel, hybrid and electric engine vehicles,” Hoff says. Mercedes invested $6 billion in its first two decades in Vance, where all Mercedes-Benz SUVs have been produced since they were introduced in 1997. Now the company is spending an additional $1 billion to build a consolidation center and battery factory on 280 acres in the Scott Davis Industrial Park in nearby Woodstock, as well as to kickstart production of electric vehicles at Vance. The new Woodstock facilities will be seven miles from the Vance site, which was the first large Mercedes-Benz production plant established outside Germany. Construction of the Woodstock consolidation center and battery plant is expected to be complete this year. “Part of the attraction of the Woodstock location was its proximity to the plant,” Hoff says. The consolidation center will supply vehicle assembly kits and spare parts to overseas markets, while the battery facility will be part of a new global battery production network for Mercedes-Benz and primarily used to support vehicle production at Vance. Some batteries may be produced for export if demand requires. The Vance plant will become one of six Mercedes-Benz EQ model production sites across the world and the Woodstock battery plant one of eight such battery plants worldwide. The Vance plant will be updated to accommodate traditional, hybrid and electric vehicle manufacturing. The Alabama operation, currently at more than 3,700 workers, is part of Stuttgart, Germany-based Daimler Group, which currently has 23 primary sites across this country. Those U.S. locations manufacture passenger and commercial vehicles and are home to other group businesses, such as Daimler Financial Services. In combination, the sites employ about 26,000 workers or 8.7 percent of Daimler Group’s total worldwide workforce. Total revenues for U.S. operations in 2017 was EUR 40.5 billion. With the expansions to the Alabama operations, including the ramp up of electric vehicle manufacturing, an additional 600 or more employees will be needed over time, the company projects. MBUSI representatives continue to work with community colleges and universities to help develop a stronger automotive workforce. With the advent of a new decade of electric car manufacturing, “We will be providing training to our current workforce to give them the new skills needed for manufacturing electric vehicles, as well as other advanced technologies,” Hoff says. The Vance plant, the first major automaker in Alabama, has helped the state draw supplier firms, too. The Vance operation uses 200 U.S.-based suppliers and continues to attract additional local suppliers. The plant has ramped up production for the new-platform GLE model, which is expected by Mercedes-Benz and others in the industry to be in high demand. The slightly larger, more aerodynamic GLE, with an abundance of user-friendly, high-tech features, made a splash at the Paris Motor Show last fall. Historically, the GLE has been the automobile manufacturer’s bestselling luxury SUV model. The new GLE has an optional third row of seats and “e-active body control” chassis for a smoother ride. Its “free-driving mode” aids in off-roading and getting the vehicle free from sand or snow. One of the new SUV’s engine options offers a mild hybrid energy boost from an EQ Boost starter-generator. About two-thirds of the SUVs produced in Vance are exported to more than 135 countries, including China, one of the company’s strongest markets. The plant produced 300,000 vehicles in 2017, and more than 3 million vehicles have been built in Vance since production began. The operation is the second largest automotive exporter in the country, according to Mercedes-Benz. Because of its global reach and significant export business, trade issues, including tariffs, do affect MBUSI, Hoff says. The company got some good news in December with the United States and China’s announcement of a 90-day moratorium on tariff increases. Both countries agreed to work together to negotiate their trade disagreements. “We are hoping negotiations continue in a positive way for everyone’s benefit,” Hoff says. Multi-year contracts with suppliers make rapid tariff increases difficult for automotive manufacturers to absorb. But Mercedes-Benz hopes to weather changing trade policies because of the quality of its product and consumer demand. “Being an international company, we are for free trade in general,” Hoff says. Kathy Hagood is a Birmingham-based freelancer for Business Alabama.